Seahorses are on the wish list of many divers, and can be regularly seen here in the Komodo National Park. These fish have their heads angled down and bodies ending with curved tails generally attached to something near the bottom blending expertly with its surroundings. Seahorses swim upright, a characteristic not shared by their close pipefish relatives, which swim horizontally. 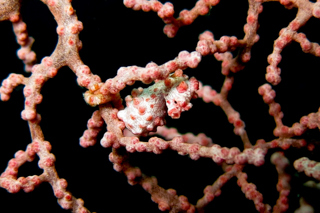 The slowest-moving fish in the world is the dwarf seahorse, with a top speed of about 1.5 metres per hour. Seahorse mating starts with a courting process wherein the male seahorse “dances” and squirts water from his pouch to show the female that it’s empty. This can go on for a few days before mating takes place. 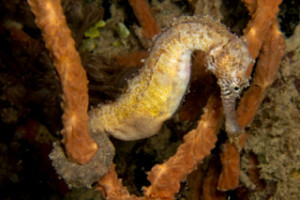 The male carries the eggs for 9 to 45 days until the seahorses emerge fully developed, but very small. He typically gives birth at night and is ready for the next batch of eggs by morning when his mate returns. Once the young are released into the water, the male’s role is done and he offers no further care and often mates again within hours or days during the breeding season. 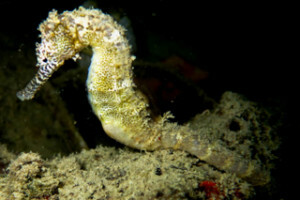 Seahorses have good vision and can move their eyes independently of each other, like a chameleon. They can simultaneously look in front and behind, which is helpful for catching prey and as a defence mechanism.